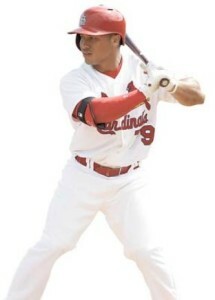 The St Louis Cardinals have called up second baseman Kolten Wong, one of their top prospects, from AAA Memphis. He should arrive in time for Friday’s game with the Chicago Cubs. He was hitting .303 in Memphis with 10 home runs, eight triples and 21 doubles. In his last 10 games at Memphis, he was hitting .351. Wong sat out Thursday night’s game for Triple-A Memphis against Colorado Springs. Wong was expected to be a September call-up but the move is being made now. Third baseman David Freese came out of Thursday’s game in the eighth inning and was replaced by Daniel Descalso, but there was no announcement of an injury. Ranked by MLB.com as the organization’s fourth-best prospect and number five on Baseball News Source’s Top 10 Cardinals Prospects list before the season, Wong will have to be added to the 40-man roster. The team will option outfielder Adron Chambers to make space for Wong.